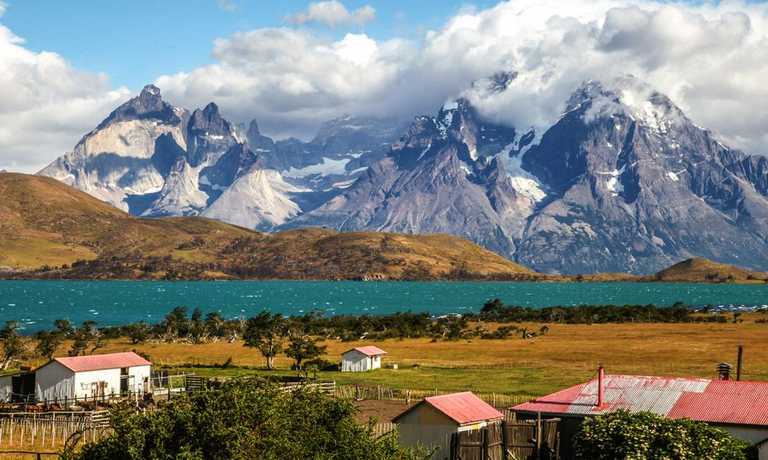 The highlights of Torres del Paine's most famous trek, from the base of a relaxed, friendly geodesic dome camp for 3 of 4 nights. Hike with expert guides and only a day pack, returning to a comfortable bed, wood burning stove and en suite bathroom. Meals and transfers from/to Puerto Natales, Punta Arenas or Calafate included. The trip begins with you being picked up from your hotel in Punta Arenas or Punta Arenas airport in the morning and driven to your accommodation. Alternatively, you can start your trip in Calafate. En route you make a couple of stops: first in Puerto Natales, a small, lively town on the shores of "Seno de Ultima Esperanza", where you can enjoy a hearty local lunch, and second at Cueva de Milodon, a massive prehistoric cave where the remains of a giant ground sloth were discovered in the 1890's. The journey is scenic and highly atmospheric, featuring many wild birds and wonderful Patagonian landscapes. 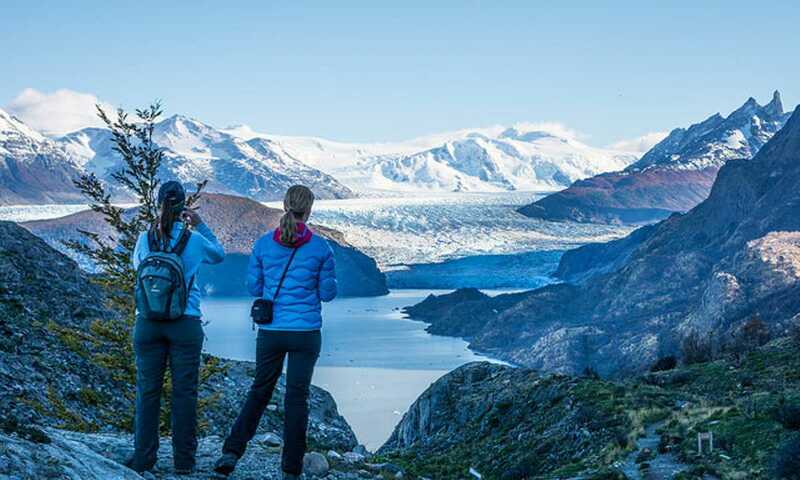 The day ends with your arrival and overnight stay at your geodesic camp, nestled in the heart of Torres del Paine National Park and with a prime view of the majestic Torres. Sunset is usually around 11pm during the summer months, meaning that there will still be enough daylight for you to admire the Patagonian steppe with its guanacos and snow-peaked mountain horizon once you arrive. After breakfast you drive toward Pudeto dock where you board the catamaran to Pehoe, from here you will begin the challenging trek to Valle Frances (French Valley), along a steep trail that leads to the very heart of the Paine Massif. How far in you go depends on your group's trekking rhythm. A swifter walk will lead you to the hanging bridge over the French River, located at the foot of the south-east face of the Massif, where you will be treated to fantastic views of the valley. You continue to ascend towards the upper section of the valley where you will be able to marvel at the extensive mass of the valley's geological formations. After your upward trek, you will pause for a picnic and relax a while. This day's trek will end as you descend through an undulating terrain of mixed grassland and light forest which will take you to Refugio Paine Grande, located on the peaceful shores of Lake Pehoe. *An optional trek to Mirador Britanico is also available. This day will see you hike from Paine Grande Refugio along the shores of Lake Pehoe to the northern side of the glacially beautiful Lake Grey. You will feast on a picnic lunch before boarding the boat that sails right to the huge, crystalline facade of Glacier Grey, where you will have plenty of time to marvel at the calving glacier. From the southern end of Glacier Grey, you will transfer to your camp. Be aware that boat trips can be cancelled if the required minimum of 10 passengers is not reached. If either is the case, you will trek up to the sightseeing point and profit from wonderful, panoramic views of the Glacier instead. Then you will return on foot to Paine Grande and take a catamaran to Pudeto's dock, where we will be picked up and driven to your camp. The goal of the penultimate day of your 5-day trek will be to complete the most famous trekking trail in Torres del Paine National Park! 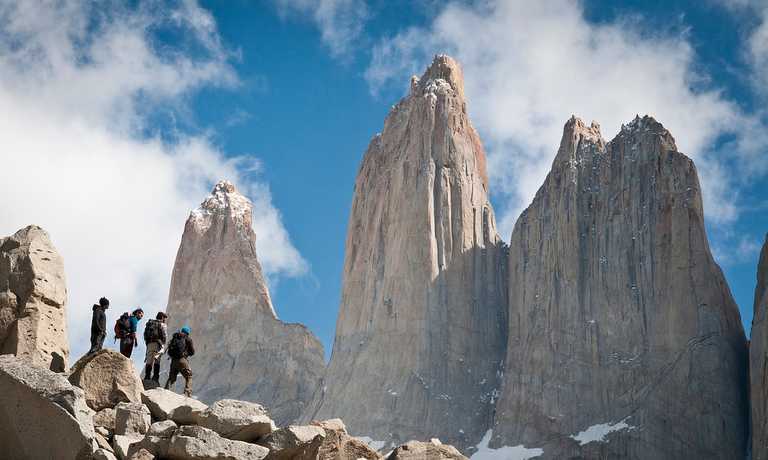 You will walk from camp towards Hosteria Las Torres before ascending to Ascencio Valley on the Tower's eastern face. Mountain ridges, beech forests and small rivers line the scenic walk towards the valley. Your big challenge comes in the form of the steep moraine, a huge mass of boulders which will lead you to that iconic base-view of the towers - three gigantic granite monoliths, the remains of a great cirque sheared away by the forces of glacial ice. After a tough uphill climb, the towers eventually come into full view, rising majestically before you, with the glacial lake visible below. Is there any better place in the world to have lunch? After feasting on the view and our picnic, you backtrack along the same trail through Ascencio Valley and return to your camp for a well-deserved dinner. 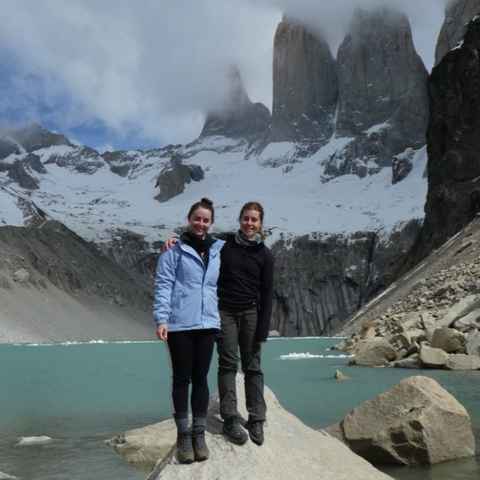 Day 5: Adios Torres del Paine! You will board an early morning vehicle, sit back, relax, and enjoy a scenic ride back to Punta Arenas in time to catch the evening flight. The highlight was day three of walking (the Tower Base hike) as the views were spectacular all day, the weather was good and the morale in the group was excellent. EcoCamp surroundings, staff and services were impeccable. 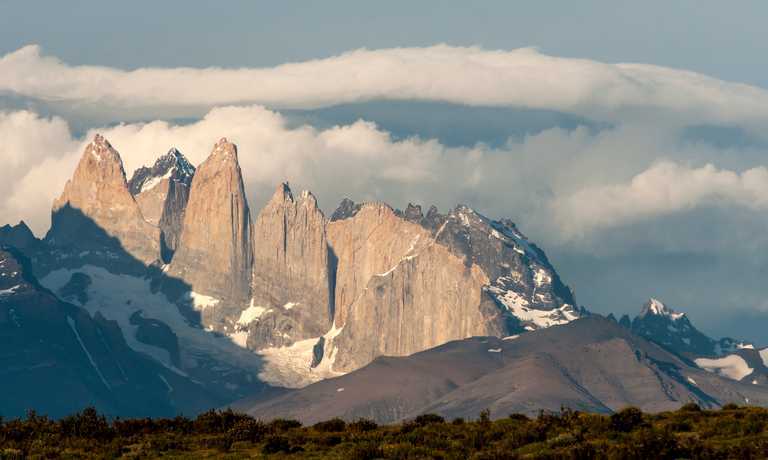 Torres del Paine is a place I'd love to visit over and over again. It was tough! but well worth it for the amazing scenery. The team at Eco Camp were just spectacular, our guide was patient and kind, and the staff back at camp made you feel welcomed. Our dome was nice and cosy, I also LOVED the yoga dome! The food was delicious and there was such a huge variety which I really enjoyed. This trip can run as a group trip, with prices starting from $1,310 per person for a complete group. If you are looking to join a group or you are a solo traveller we will help to form likeminded groups of travellers. Please let us know your travel plans. Prices shown are for accommodation in a Standard Double Dome. This trip departs every Monday from October 2018 to April 2019 with prices varying depending on the season.